It is a fact. There is a place in town where you will find largest hamburger. 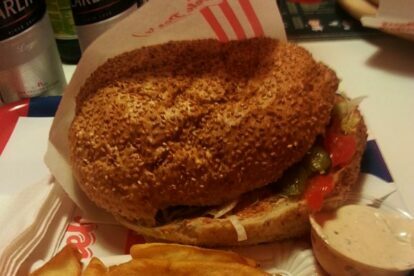 The name is Zloburger (Evilburger, zlo=evil) and with its 330g bun and 200g of meat, plus especially made sauce and salad the total portion is approximate 600g of “pure evil”. Hence the name! Although it is a bit out of the city center it is truly worth a visit, especially because of the neighborhood feeling in this part of town. Due to the fact that its interior looks like a genuine American diner and the only thing missing is the waitresses on roller-blades, you would get the instant feeling that you are in “Grease” the movie and the year is 1958. Beside hamburgers, here you can order different grilled meals, tortillas and even pizzas, prices differing from Kn 18 to Kn 65 for a Triple-Double Evilburger. If you dare :-)! Speaking of dares, there is an unprovoked made “wall of fame” table in the diner called “Top Gun Stomach” which highlights the best results. At this moment the record is 4 Evilburgers and 2 Cola’s (0,5l) in a time of 45 minutes.